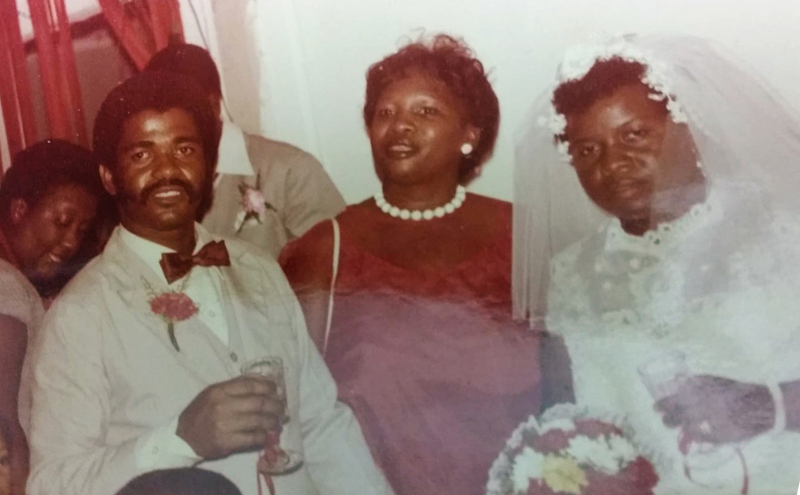 A Dad, A Daughter, A Disappearing Act: Love And Mourning On Father's Day After waiting a lifetime to meet her father, NPR journalist Maquita Peters finally got to know him, only to have him vanish from her life. 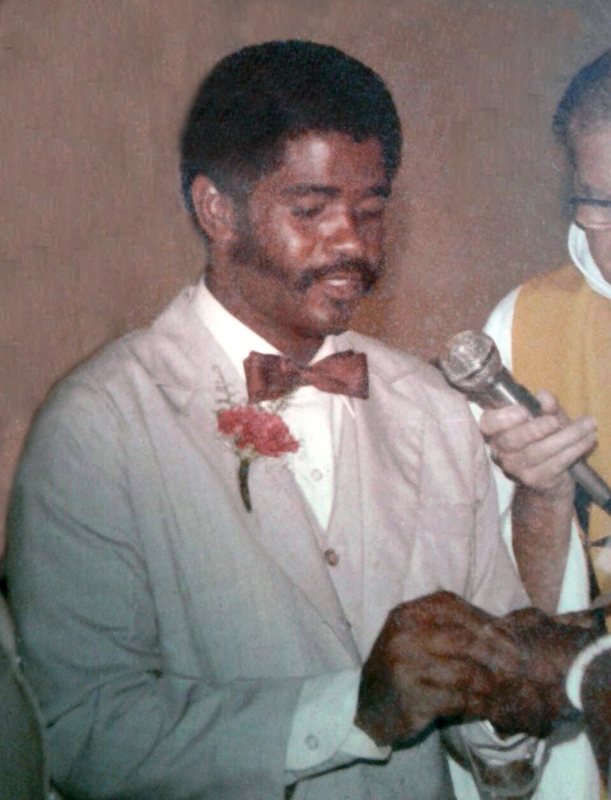 Roy Leonard Brackin, father of NPR editor Maquita Peters, and his wife, Rosie, are seen on their wedding day in Port-of-Spain, Trinidad and Tobago, circa 1981. My father has always been disappearing from my life. The first time he did so was right after my teenage mother told him she was pregnant with me. Over the next few years, he would suddenly reappear and disappear. It was never in person, but through telephone calls and letters across the ocean from his home in Trinidad and Tobago to mine in Barbados. His "here today, gone tomorrow" routine made for a rocky relationship between us; my mother, Victoria, raised me as a single parent. It would take almost a quarter-century before we met in person. After that, my dad and I eventually (and somewhat miraculously) built not just a parent-child relationship, but also a very dear friendship. We evolved from hostile father-daughter interactions to a father who doted on his first-born and a daughter whose heart danced upon hearing her father's sweet singsong Trinidadian accent. It seemed as if my dad had retired as a magician — no longer pulling disappearing stunts. For almost a decade, he was a constant in my life, and albeit late, I came to know and love what it felt like to have both a mother and a father. 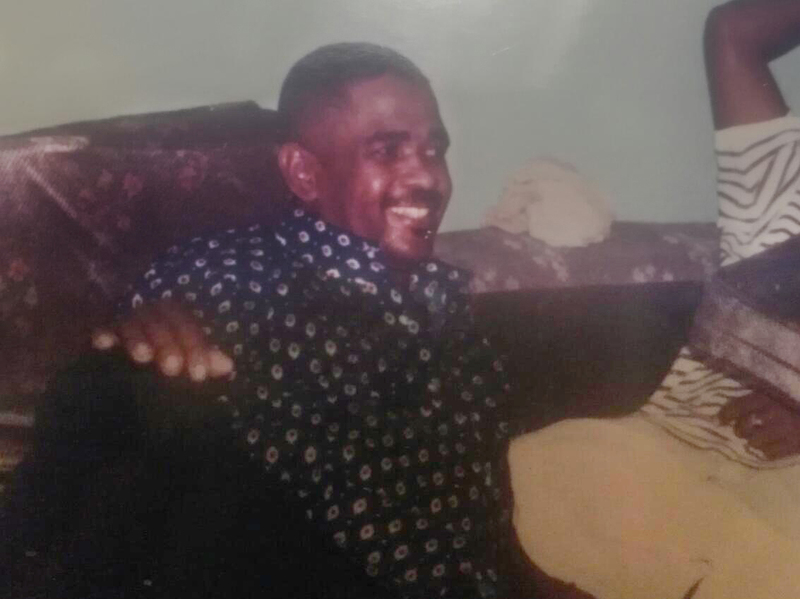 But another decade has now passed — and today marks the 10th Father's Day since my father again disappeared for what may have been the final time, as I fear he might be dead. I never called my father "Daddy" or "Dad." He was simply Lee, short for Leonard. It was weird to address him as anything else, even after we had formed a close bond. I met Lee the year I turned 23. It was a year of many firsts: my first trip to Trinidad; first time participating in that nation's renowned carnival and first time traveling with friends to another country to watch our wonderful West Indies cricket team play. It was the latter that paved the way to meeting my father for the first time. That moment is one of the most emotional of my life. But it was initiated by neither my father nor me. NPR editor Maquita Peters' relationship with Lee Brackin evolved from hostile father-daughter interactions to a father who doted on his first-born. At the time, my friend and now late West Indies' cricket legend, Malcolm Marshall, was the team's coach. "Maco," as he was affectionately known, knew my story and had long encouraged me to meet my father. Knowing I would be in Trinidad that weekend, Maco contacted my father and invited him to the hotel where the team was staying. On the morning of the cricket match, en route to Queen's Park Oval, I stopped by the hotel to collect my tickets from Maco. And standing with him was a man — unknown to me, yet familiar-looking — and an adorable boy of about 7 or 8 years old. The man began to walk in my direction. And I began to tremble. As Maco uttered the words "this is your father," the stranger grabbed and held me tightly, breaking down in tears. I, too, started to cry, as did the little boy – his youngest son and my half brother Lyndon. "My daughter, Maquita," were the first words Lee said to me. "I am so sorry." I returned his embrace still shaking, speechless. When my father and I regained our composure, Maco sat us down. He advised me to forgive and pleaded with my father to take his role seriously. He then gave us the tickets to go off and enjoy the cricket match together. Lee was an amicable man, a charmer and social butterfly. I lost count of all the people who walked up to him and in the rawest of Trinidadian accents, asked: "Lee, is how she look like you so, uh dat yuh daughtah?" He was ever at my beck and call, bringing drinks and food, repeatedly checking to see if I was doing OK.
That day, I felt proud to be called his daughter. 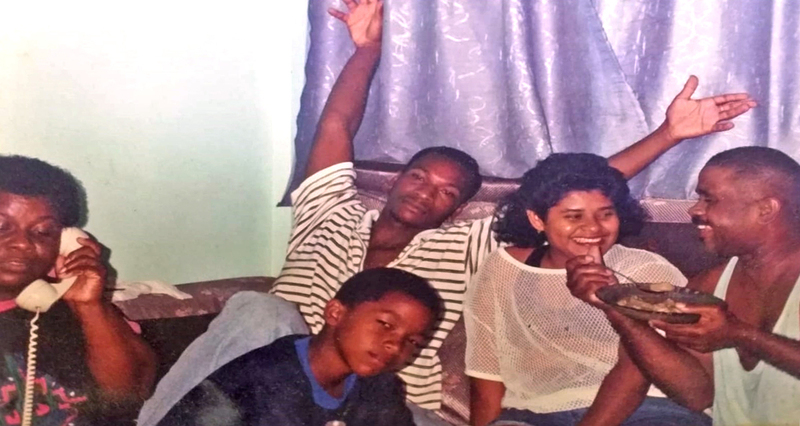 Lee (right) entertains family and friends at his then-home in Tunapuna, Trinidad and Tobago. Peters describes her father as an amicable man, a charmer and social butterfly. A couple of years later, I moved to Trinidad to work as a freelance reporter. My father insisted that I come live with him and Rosie, his wife of about 20 years. I walked into their living room — and froze. There, on the wall were framed photos of me through the years. He often didn't respond to my letters — but had saved and displayed all the photos I had sent. He had also kept every letter. When Rosie showed me my room, I was in awe again. They knew I loved teddy bears and had adorned my bed with them. To protect me from the vicious Trinidadian mosquitoes, they had secured netting over my bed. They bought groceries to prepare my favorite meals, and Rosie, knowing I loved to cook, even taught me to prepare several local dishes. My father took me to his favorite entertainment event – Panorama, a steel band competition and vital part of Trinidad's Carnival. But it wasn't always a party with Lee and me. In fact, many of our early interactions when I first moved into his home ended up in disagreements. I was already set in my ways as a 20-something who had been living on her own in Barbados. I was not open to being told by a father who didn't raise me how long to stay on the phone, when to go out and with whom, or what time to come home from partying. And Lee seemingly couldn't come to terms with the fact that I was an adult and not a little girl. Plus, I resented him for deserting my mother and me. One day, I asked him why. "I don't know," he said. "I don't have an answer." This only made me angrier. After all those years, that was the best he could offer? It would take some intervention from my mother — who gave Lee pointers on how to relate to me and encouraged me to forgive him — for Lee and I to finally get along. When I eventually went back to Barbados for work, Lee and I kept in weekly phone contact. One day, in the early 2000s, Rosie called to say that Lee had been rushed to the hospital and was in critical condition. I immediately flew to Trinidad. Unbeknownst to him, Lee was a diabetic and had gone into a diabetic coma. Luckily, he received treatment in time, which saved his life. Rosie helped nurse Lee back to health, changing his diet and keeping his blood sugar under control. Because of his diabetes and the fact that I had come so close to losing him, I made sure to stay in contact when I went to New York in 2005 to further my studies. Lee and I talked several times a month, and like a true dad, he was always concerned about whether I had enough money for tuition, rent or groceries. From time to time, either he or Rosie would call to say, "Go to Western Union, uh send something fuh yuh." Lee and I never missed each other's birthday or any other special occasion. He once said, "I know if only one of my four children calls me, it would be you." It would take some intervention from Maquita's mother — who gave Lee pointers on how to relate to Maquita and encouraged her to forgive him — for the author and her father to finally get along. So when I tried without success to reach him for his birthday on Nov. 30, 2008, I knew something was wrong. Lee never answered or returned my calls. A month later, at Christmas, I still could not reach him. I was especially worried because of some events earlier in the year. Rosie had died suddenly in April after suffering a heart attack, and Lee had been depressed when he had called with the tragic news. Then, at the start of summer, he called to deliver another equally sad message; his mother, my grandmother, had also suddenly taken ill and died. While I didn't think he was the type to be so deeply drenched in grief to take his own life, I was concerned that both deaths were unbearable for him. In January 2009, after countless efforts to get some word on Lee, I got a call from an employee at Trinidad's Ministry of Sport and Youth Affairs in Port-of-Spain, where Lee had worked for several years. She informed me that he had been missing from work since early December and that searches by colleagues yielded nothing. My brother Lyndon said our Aunt Jean had filed a missing person report, but the police also came up empty-handed. My brothers Lyndon, Glen and other relatives and friends combed the St. Augustine area where Lee last resided — with no success. Lee's passport, identification card, important documents and all his clothing were found at his home not far from the University of the West Indies. None of his friends had heard from or seen him in months. When anyone called, his cellphone would ring and ring. For at least three years after his disappearance, I would call Lee's phone and it would still ring. I've endured endless sleepless nights. I've cried my eyes dry. I've exhausted all possibilities for help on the matter. Every day, I pray for an answer. Just these past few weeks, I tried again with my search, reaching out to a former Columbia University classmate, a journalist in Trinidad. I asked her to check her police sources for any updates. "Nothing," she said. "It is bad." I wish I could get some closure. As I finish writing this essay, with shaking hands, I dial that 868 area code for Lee. Three times. An automated recording greets me each time: "Sorry, your call cannot be processed at the moment. The number you're trying to call is not reachable." Lee — Dad, wherever you are, I hope you are at peace. I miss you, and with all my heart, I love you and wish you "Happy Father's Day." Maquita Peters is an editor at NPR.org. A version of this essay previously appeared on Peters' personal blog Caribscribe.com.